We view our vineyards as evolving ecosystems that grow in complexity with proper management. We recognize that our vineyards are part of the larger surrounding ecosystem affecting the health of nearby wildlife and woodlands and the quality of our water supply. Balanced vine nutrition means promoting the natural microbiology of our living soils through composting, cover crops, biological diversity, and limited nitrogen additions. We farm land that is part of an important watershed. Our standards guide local winegrowers in returning to traditional conservation methods which avoid soil erosion, runoff, and the overuse of nitrogen fertilizers. Our vineyards contain wild and planted areas among the vines and on the farm's perimeter that are allowed to bloom and go to seed, ensuring the health of our native flora and fauna including beneficial insects and native bird populations. Before intervening, we scout our vines for pests and disease and then make a decision on how to proceed. 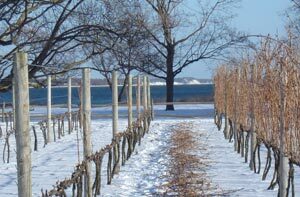 Long Island Sustainable Winegrowers make every effort to use reduced risk and low impact materials in our vineyards. We support the largest labor force in the region and are pillars of responsible farming in our local community. We have also partnered with the Suffolk County Department of Health Services to ensure we steward our local water aquifer appropriately.